The eclipse is here! Updated Aug. 21 with final webcast details. You can watch all the major NASA webcasts on one page here. Experience the 2017 total solar eclipse virtually: People who are outside the eclipse path, under cloudy skies or hoping to stay indoors have plenty of options to watch the celestial event live. NASA's livestream, called "Eclipse Across America: Through the Eyes of NASA," will feature live views of the eclipse, from viewers around the world, 11 spacecraft and three NASA aircraft; and from more than 50 high-altitude balloons and astronauts on the International Space Station; plus views of eclipse celebration events across the country, NASA said in a statement. Viewers may also expect commentary and presentations by NASA scientists; the webcast will last for multiple hours. Watch NASA's eclipse webcast here — there are options to watch through NASA Edge, NASA TV, Ustream, YouTube and more. NASA's Facebook page will carry a 4K, 360-degree livestream of the eclipse from Charleston, South Carolina. Slooh, the online community observatory, is hosting a three-day celebration of the eclipse in Stanley, Idaho, and will provide live coverage of the event itself as the eclipse races from coast to coast. The online observatory will also feature commentary from experts "covering everything from the science of eclipses, advice on how to observe the eclipse from your own backyard, together with [its] team of cultural correspondents, who will shed light on the history and spirituality of eclipses." You can watch that webcast at Slooh.com starting at 12 p.m. EDT (1600 GMT), and we will also stream it live on Space.com, courtesy of Slooh. 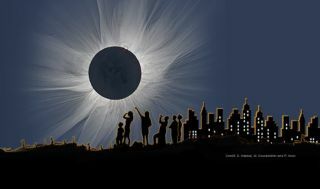 ABC will air a two-hour special on the eclipse starting at 1 p.m. EDT (1700 GMT). It will be anchored by David Muir and will feature reporters checking in from viewing parties and events, and interviewing people as they watch the eclipse, according to Brian Steinberg at Variety. Meteorologists Ginger Zee and Rob Marciano will also weigh in from Nashville, Tennessee, and Lincoln City, Oregon, respectively. The broadcast will also air on http://abcnews.go.com/live as well as Facebook Live and YouTube.